Protein Powder. 100% Whey Protein. Banned Substance Tested + Gluten Free. 100% of the Protein from Whey Protein. Whether youre preparing for a hard workout, recovering from intense training in the gym or simply looking to increase you protein intake, Elite 100% Whey Protein is the perfect anytime protein. Elite 100% Whey Protein flavors are developed in-house so they are delicious every time you enjoy an Elite 100% Whey Protein shake. Think of it as an indulgent, smart reward for your hard work and dedication. Fast-Digesting, Fast-Absorbing, 100% Whey Protein: Make the most of your workouts with Elite 100% Whey Protein. Each serving of Elite 100% Whey Protein is packed with 25 grams of high-quality, fast-digesting and absorbing whey protein, including whey protein concentrate, whey protein isolate and whey peptides to support even the most rigorous athletic and fitness goals. The superior quality of Elite 100% Whey Protein utilizes cross-flow microfiltration processing to preserve the important muscle building properties of whey protein and whey protein fractions such as alpha-lactalbumin and beta-lactoglobulin, serum albumins and immunoglobulins. Elite 100% Whey Protein is formulated by in-house research and development scientists by carefully selecting ingredients that meet our high quality standards and specifications. Real Science & Quality: Dymatize proteins are formulated based on the latest science and put to the test in university studies and at elite professional training facilities. Dymatize protein powders are always manufactured in GMP and Sport Certified facilities, meaning that all ingredients and final products are rigorously tested and validated clean and safe. They are banned substance tested for athletes reassurance by Informed-Choice. 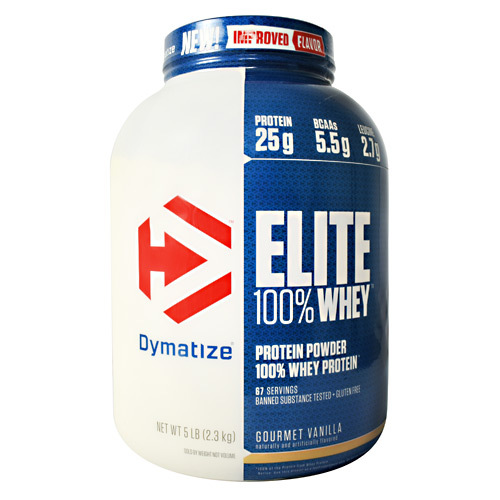 Dymatize Protein Ethics: 100% of the protein claimed per serving is derived from high-quality, pure, intact proteins. We do not amino spike. All Elite 100% Whey Protein powders are instantized for easy mixing, ensuring that you get world class taste and consistency from every serving.